At the end of May one of my reenactment groups, the 45eme Regiment de Ligne, is putting on a Waterloo themed display at Horsham. My planned contribution is a display game of the Battle of Waterloo, played in my role as a pensioner of les Invalides. This will be a big “bathtubbing” exercise, because I intend to replay the battle on a table two feet (60cm) square, divided into 144 squares. I have the basic terrain ready, but some of the cork tile pieces representing higher ground need to be painted and gridded to match the table. Hougoumont, with a battalion of Guard Infantry and a company of skirmishers in the orchard. 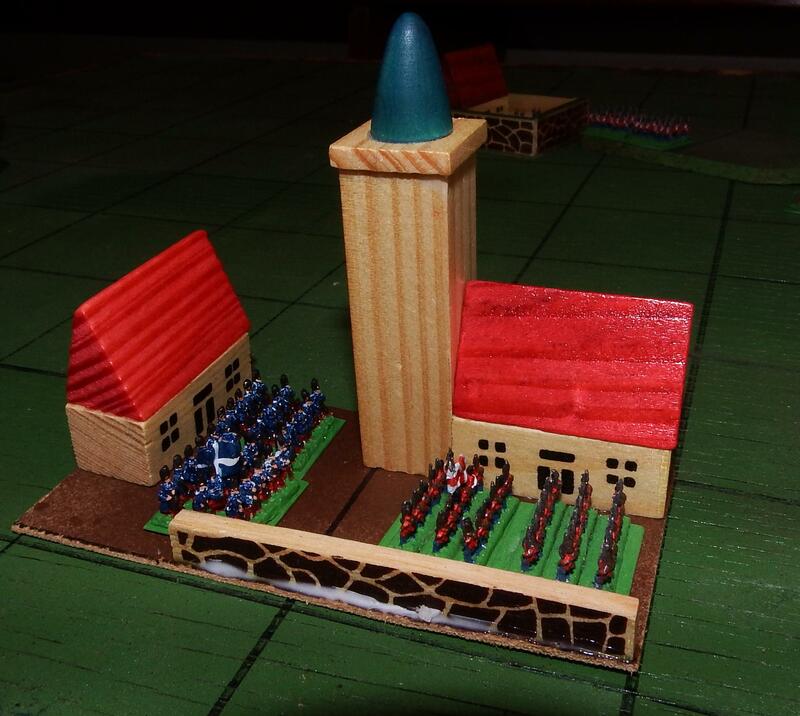 My original Hougoumont occupied two squares and was too big. Then most of the figures need to be painted. 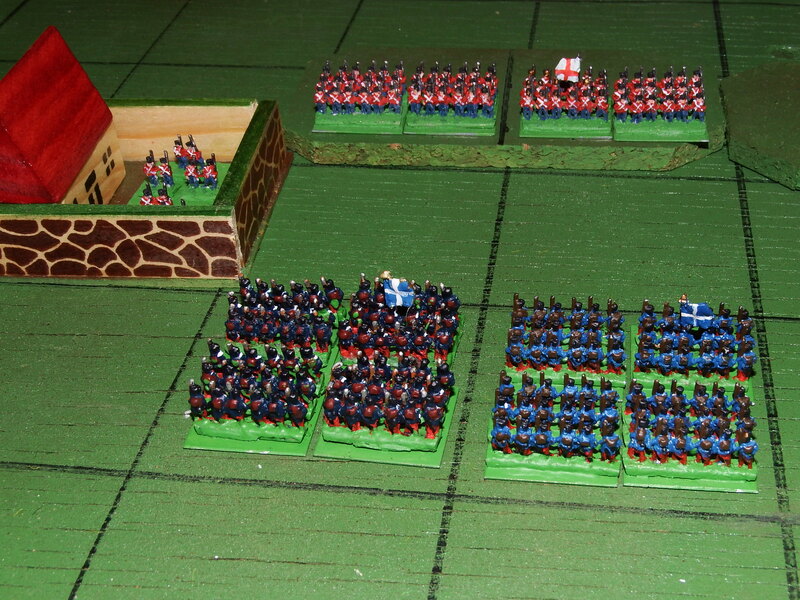 I will use the 6mm generic Red and Blue armies that I have been developing for this game. Tentative orders of battle are prepared. Units in the order of battle consist of four bases as shown in the photographs, except artillery which will have two gun bases. Maybe I will include two limbers as well – that remains to be seen. Their presence or absence will not affect the game. Red casualties will be recycled. When 4 bases of the same type (2 for artillery) have been lost there will be a chance that an identical Prussian unit will appear on the south-east corner of the table near Plancenoit. Plancenoit village. 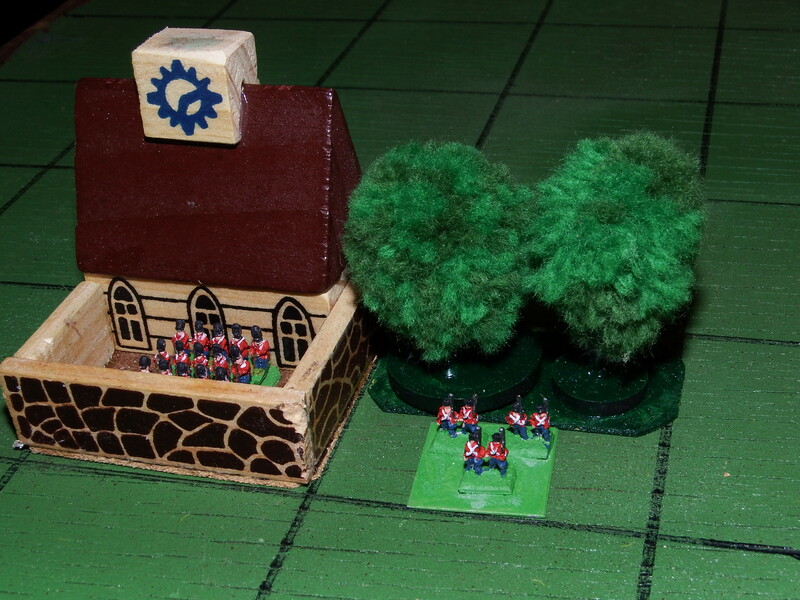 Red (Prussian) reinforcements advance against Blue(French) Guard Infantry – it’s as exciting as watching glue dry. More news as the project develops.